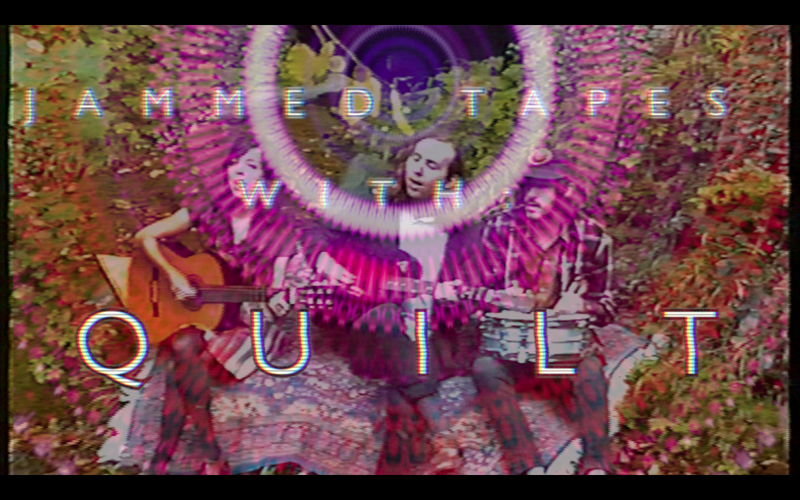 ::: JAMMED TAPES SESSION ::: QUILT – IS YOUR CLAM IN A JAM? Back in September, I met up with sonic weavers Quilt before their gig at the Rural Indie Camp Festival held on the hills behind Genova, Northern Italy. I had first heard about Quilt a couple of years back when I caught them opening a gig for Mexican Summer label-mates The Fresh and Onlys in Williamsburg. While the headliners played a more ballsy rock and roll that I wasn’t quite in the mood for, I got lost in the awesome opening band’s intertwining dreamy melodies, knitting a warm musical blanket for collective souls to be tucked under. That night, there was a song in particular that struck a chord that kept resonating in my head. It was some sort of long, cosmic space jam with a beautiful riff keeping it grounded. I bought the record right after the show and soon enough found it in a more structured form as Cowboys In The Void, the second song on the album. When we met again at the end of summer I waited for them to finish soundcheck as I walked the hills around the small village of Savignone to find a spot that would capture their sound in the best way. This ended up being a little spot under a cave on the banks of a mountain stream where they sat down and played an magical acoustic rendition of the very song that got me into them. After the session we hung out in the Medieval town talking about music and modern social patterns over some red wine, while we waited for the festival to begin. When the rest of the bands finished playing Quilt finally took the stage and sent the audience in a collective trance flying on a moonbeam over the tall trees surrounding the venue. To see what I mean check out Cowboys In The Void through the usual Jammed Tapes Technicolor Swirl below!